Here’s a fun new toy in the Reaktor library for you. It’s two recordable XY faders with IC send modules so you can send the controller info to another instrument in the ensemble. I’ve found it’s a great way to perk up a boring instrument without much effort and re-engineering. To demonstrate that, it’s wired up to control some of the knobs on an old FM synth from an earlier version of Reaktor. But of course, the whole point is to experiment and wire it up to whatever you please – maybe even something you’ve built yourself. For my next tutorial, would you folks be interested in having this dissected and explained? There’s a lot going on under the hood in this one. 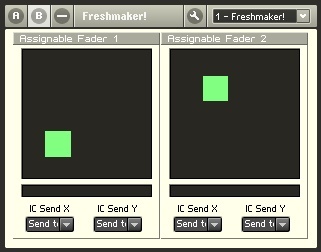 This entry was posted in Downloads, Ensemble, ensembles, Practical Reaktor and tagged controller, freshmaker, instrument, reaktor on June 23, 2007 by peterdines.